Norma Rose Point School is a Kindergarten to Grade 8 School that opened 3 years ago on the original site of University Hill Secondary on the University Endowment Lands of the University of British Columbia. 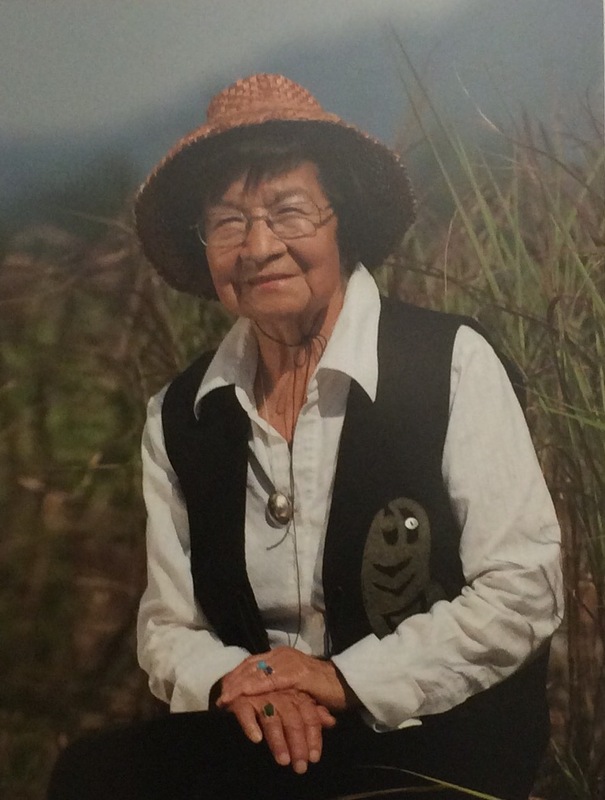 The School in located on Musqueam ancestral lands and named after reknowned Musqueam Elder and educational leader, Norma “Rose” Point. Students are organized into nine learning communities of two to five classes of students. Students and staff are encouraged to ask questions, work collaboratively and share their learning with peers. The articulation of the First People’s Principles by FNESC, the surrounding land, the significance of the signing of the Aboriginal Enhancement Agreement with the Vancouver School Board and the new curriculum in B.C. has opened our minds to learning about and embracing Indigenous ways of knowing. Indigenous cultures demonstrated one of the earliest expressions of democratic structures of governance by problem solving and making decisions in circles that gave equal voice and power to all people in the group. That is what we strive to do at Rose Point School. Martin Brokenleg has been inspirational in Indigenous, as well as educational spheres. 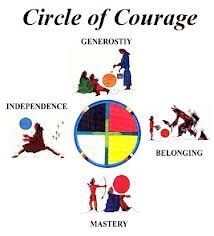 His Circle of Courage was initially framed as a model of positive youth development in the book Reclaiming Youth at Risk, co-authored by Larry Brendtro, Martin Brokenleg, and Steve Van Bockern. As explained in the link, “The model integrates Native American philosophies of child-rearing, the heritage of early pioneers in education and youth work, and contemporary resilience research. Brokenleg et al. identify belonging, mastery, independence, and generosity as basic growth needs of all children to thrive.” (Brokenleg et al.) It has served as the basis for framing the Code of Conduct at Norma Rose Point Elementary School. Students are challenged to think of their unique qualities and “voice” they bring to the group, as well as their responsibility to maintain the safety and nurturing aspect of the community. 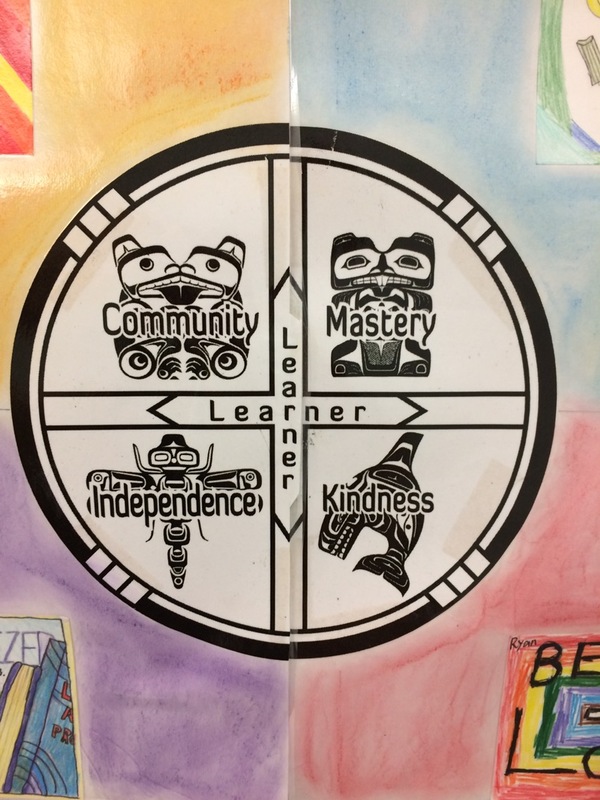 Indigenous symbols that are meaningful in Coast Salish Culture are used to represent the big ideas presented in the Norma Rose Point (aka NRP) Circle of Courage. Belonging is central to the definition of Community and symbolized by bear. Kindness is used to put the focus on generousness of giving of self rather than goods and is symbolized by the whale. Independence is symbolized by the dragonfly and represents our ability to take responsibility for our learning and actions. The beaver represents taking responsibility for attaining goals to maintain health, curiosity and lifelong learning. I came to Norma Rose Point as Vice Principal in January. Of course this role includes many discussions about the whole gamut of choices made by students. The beauty of the NRP Circle of Courage is it changes the conversation. 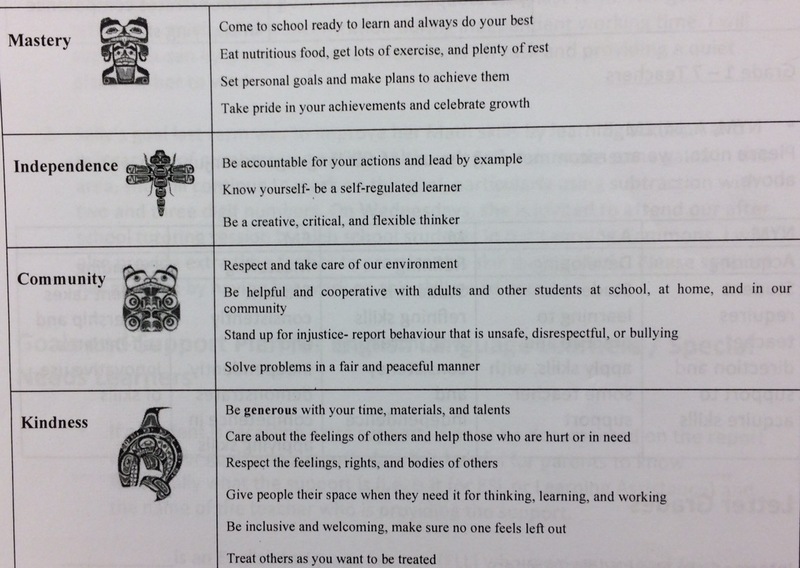 Students are able to reflect on who they are and the choices they are making and their commitment to the community. Discussion of restorative justice frames the process. The goal is to help students apply the Circle of Courage to their lives in and out of school throughout their lives. 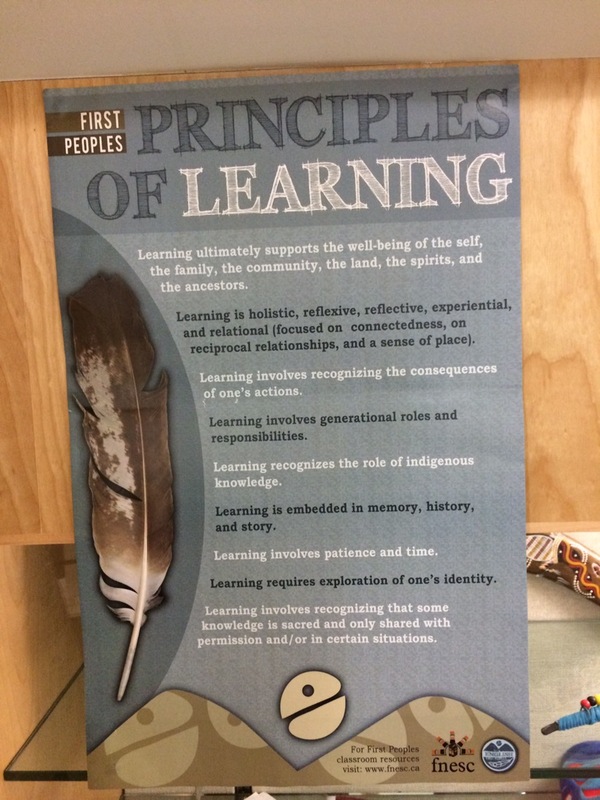 ADDENDUM NOTE: For a powerful description of the First People’s Principles of Learning, check out Laura Tait. Her explanantion with pictures and stories of her family is inspirational. Investigating Our Practice Conference in the Faculty of Education on Saturday, May 14th. The day was filled with poster presentations, talks and interactive experiences by undergraduates, grad students, faculty and alumni. It was particularly exciting to see the level of engagement of the student giving up their very sunny Vancouver Saturday to consider a range of ideas and questions. For those of you who are not Vancouverites, when the sun comes out in full glory, we go outside – never quite certain how long it will be around. Of course, the list goes on. 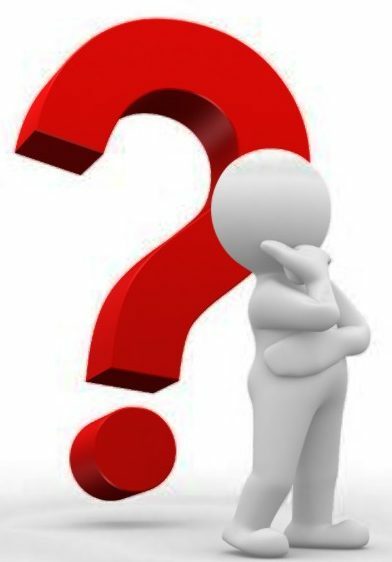 Another interesting aspect of our collaborative group was the power of inquiry in developing our professional practice as educators throughout different stages of our careers. Both student teachers have found a way to focus their professional learning throughout the practicum experience. Claire Rushton, as the coordinator of the Social Emotional Learning cohort has used the outdoors to bring Richard Louv’s work to life and introduce the power of “nature … as a healing balm for the emotional hardships in a child’s life..” by integrating the experiences in nature to frame discussions of social – emotional learning. I have engaged in a personal inquiry of how to use iPad APPS (photos, Drawing Pad, Book Creator, Twitter) as a way to access information, document and share outdoor learning. I’ve also been able to support the staff I interact with on a regular basis in their own inquiries. Inquiry, as framed by Judy Halbert and Linda Kaser in Spirals of Inquiry, has provided a framework for beginning teachers as well as a school administrator and university instructor. The learning has fuelled more questions and future inquiries. I very much hope our collaboration continues…perhaps after the frenetic pace of the end of practicum, final observations and reports and end of year demands and celebrations! 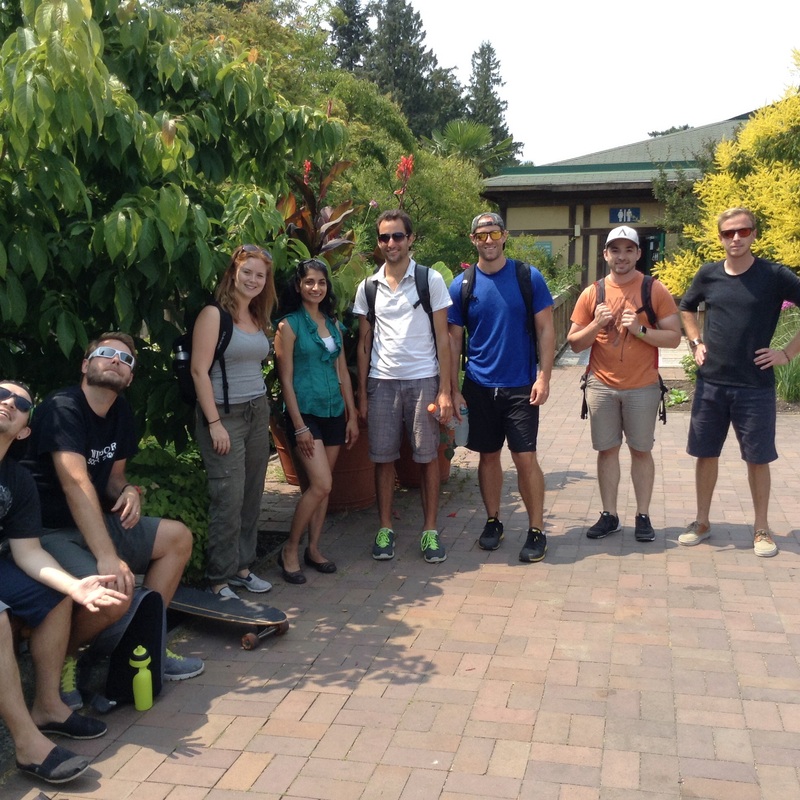 I met Hartley Banack’s Faculty of Education (EDCP323) class outside the Botanical Gardens at UBC. The class is a diversified group with some students completing Bachelor of Education requirements and some practicing educators working towards a diploma in Outdoor Education. Several Vancouver schools are actively engaged in working with teachers and their Community Schools Teams to provide outdoor learning opportunities for their students so I was thrilled to be a part of this class. We chatted about outdoor learning opportunities, challenges and goals at my school under the pagoda. 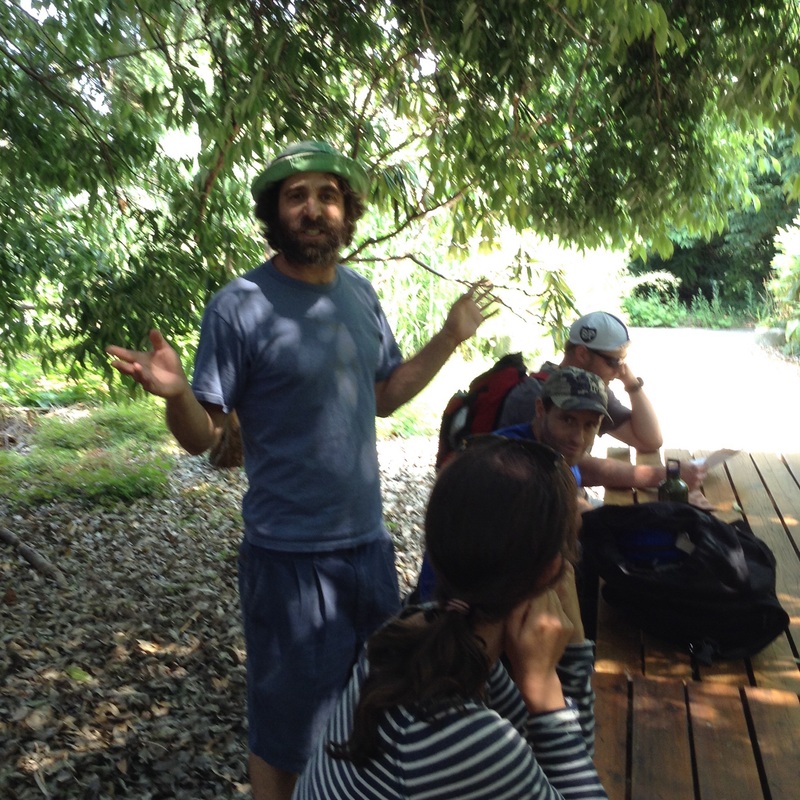 We continued the discussion of possibilities and considerations en route to the amphitheater. Student presentations and discussion of articles focusing on experiential learning continued in a shaded area of the amphitheater. Discussing outdoor learning WHILE we were outdoors was a perfect. It was inspiring to be part of this class because it provides a model for outdoor learning that is currently being explored in many schools with a clear understanding of the merits of outdoor learning. In some cases, outdoor opportunities to learn are specifically focused on the sphere of P.E. When I first started teaching in the Abbotsford school district, there was a P.E. specialist in every school. The calibre of the instruction was high and I learned a lot from teachers with extensive background knowledge. In my current context, I am still learning a lot from teachers with well developed background knowledge in Physical Education who are classroom teachers. Mr. Wan has a passion for physical education and organizes equipment for classroom experiences, extra-curricular sports and outdoor opportunities at lunch. His class each year is trained to set up badminton nets, the ping pong table and equipment for outdoor play at lunch time. Ms. Harris has worked with Action Schools to train student leaders to facilitate games for the younger children and provide classroom equipment for outdoor play. Teachers have participated in professional development and arranged for special outdoor events such as The Terry Fox Run, Sports Day, Jones Park play, Grade 6 Camp, kayaking in Deep Cove, Beach Day, and Queens Park day, . Parents actively fundraised for four years and worked with volunteers from the Knight and King Edward PriceSmart Foods to ensure out students had a playground for free play. Ms. Collins, PAC and our ever supportive husbands worked with us to secure the Small neighbourhood grant and build four garden beds on the school grounds. Several of our teachers have worked with their classes in the garden and been involved in programs such as Growing Chefs to teach students about science and food sources. For many years Ms. Evans has worked with student leaders to facilitate participation in the Fruit and Veggie Program and the Dairy Foundation Program for early primary. And yes, she even arranged for the cows to come to Tecumseh! A sight to behold, kids sitting down on the cement fully engaged in just watching the cows. School wide sorting of waste into composting, recycling and landfill garbage has also helped to extend learning about our environment and ecosystems. Integrating outdoor learning beyond physical education and science is the next challenge. Ms. Collins and Mr. Larson are actively involved in teaching students about human rights. Their annual participation in Walk For Water is a great example of how the outdoor experience is integral to the learning. Our playground includes picnic tables down by the swings. This lends itself to allowing students to working outdoors. One year my Grade 4 students looked up in the sky to see eagles attacking a crow. It made for some great poetry! The accessibility of iPads has allowed students to easily take their own photos to inspire or support their written work on Apps such as BookCreator or ExplainEverything. Vancouver Schools are fortunate to have a well developed Community School Teams. The secondary school and the elementary schools that feed into them form a hub. Administrators meet regularly as a group and with the CST staff to provide opportunities and after school programs facilitated by student leaders from the secondary school and paid programmers. In our school, the variety or field options and the garden allows for varied outdoor experiences. It is exciting for the discussion of outdoor learning opportunities in schools to be happening at the university and in schools with a mind to share ideas. 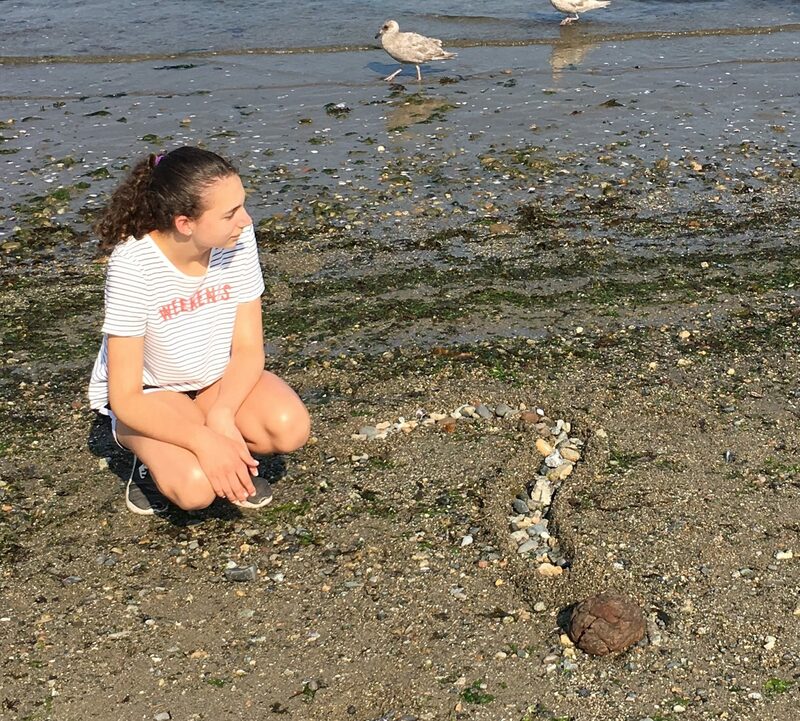 Hart Banack has assigned his students to form working groups to investigate the possibilities for outdoor learning in the school grounds and in the communities of several school sites in Vancouver. The bank of ideas with details such as related costs and curriculum connections will be invaluable as the new year begins and yearly planning unfolds. I can’t wait to hear their findings and ideas for sharing information with teachers. Special thanks to Hart Banack, UBC and EDCP323 students for welcoming me into your class and supporting our work in schools.